This article is about fixing one of the three basic tennis errors. 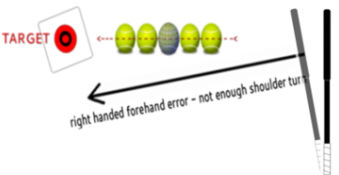 The tennis ball can go wide if a predetermined target of distance and angle is not correctly matched by a proper mixture of shoulder turn, ball speed, and net clearance during the execution of a stroke. Any miscalculation during the execution of the progressions of a stroke can cause a tennis ball to go wide. Poor footwork can contribute to an improper amount of shoulder turn. An improper degree of shoulder turn can contribute to an improperly timed string-to-ball contact point. An improperly timed string-to-ball contact point can result in an undesired ball flight path angle. An undesired ball flight path angle can allow the tennis ball to miss its intended angular target and land outside of the court boundaries, wide. Imagine that the Racquet Face (string pattern) has Eyes. A tennis ball hit flat (no intentional spin) is going to begin traveling horizontally and vertically in the approximate direction the racket face eyes are "looking" at the moment of string-to-ball contact. The ball flight direction may need horizontal or vertical direction adjustments if the tennis ball crosses over the sideline boundaries along either edge of the tennis court. The racket speed may need to be adjusted. Improper footwork can result in too much or too little shoulder turn; shoulder turn problems and/or poor timing of the tennis racket string-to-ball point of contact (early or late) within the hitting zone can cause a tennis player to send the tennis ball wide on either side of the tennis court while attempting any kind of stroke or hit. Late contact - the tip of the tennis racket meets the tennis ball after the ball has passed by the intended string-to-ball contact point. Less shoulder-turn away from the target is needed. Too much shoulder turn moves the tennis racket too far away from the intended string-to-ball contact point. The excess shoulder turn allows the tennis ball to pass through the intended string-to-ball zone of contact before the tennis racket has had enough time to arrive for an on-time contact. The tennis racket arrives too late to send the ball on a horizontally accurate flight path. A late tennis stroke can send the tennis ball down the line and wide of the sideline boundary line the dominant hand and arm are nearest. The ball is said to have gone wide because the stroke was late. Note: If the amount of shoulder turn seems to be correct, then try starting the stroke a little bit sooner. Experiment with starting sooner and later. Early contact - the tip of the tennis racket meets the tennis ball before the ball can arrive at the intended string-to-ball contact point. More shoulder-turn away from the target is needed. Too little shoulder turn does not move the tennis racket far enough away from the intended string-to-ball zone of contact. This lack of shoulder turn allows the racket strings to the pass through the intended string-to-ball zone and contact the ball before it has entered the intended zone of ball-to-string contact. The tennis racket arrives too early to send the ball on a horizontally accurate flight path. An early tennis stroke can send the tennis ball diagonally across the tennis court and wide across the side boundary opposite from the dominant hand and arm. The ball is said to have gone wide because the stroke was early. Experiment with starting the stroke later and sooner, whichever of these is your problem, learn how to do make the opposite mistake. This will allow you to find a more desirable location to make your string-to-ball contact, between the two mistakes. A proper amount of shoulder turn allows more on-time string-to-ball contacts to happen and increases your chances of being able to send the tennis ball on an accurate horizontal flight path to a predetermined target. Hold your arms up horizontally at shoulder height. Use your feet to position your shoulders so that your non-dominant hand and arm are pointing at your intended target while your dominant hand, shoulder, and tennis racket are pointing directly away from your intended target. Adjust the tip of your tennis racket to point in the direction of the back fence (away from the target), the "eyes" of the front face of the tennis racket to look down at the bottom of the side fence, and your feet to be on the same line as your arms and shoulders; now, slowly take an average sized step in the direction of the target and swing the tennis racket in super slow motion. Stop the swing when the tip of the tennis racket and your dominant hand are about the same distance from the intended target. At this point, most of your weight should have shifted onto your forward foot and your shoulder should be slightly closer to the target than your forward foot. Check your weight transfer by raising your back foot off of the court surface: You should be perfectly balanced on only your forward foot. The line through your shoulders, prior to beginning the stroke, was to show you how much shoulder turn you'd need in order to hit the target. The slow motion swing and stop was to show you where your intended string-to-ball contact point needs to be to send the ball to the target. Repeat this process from different locations on your side of the tennis court to get the feel for using your feet to set your shoulders up for various targets on the other side of the tennis court. Hold your arms up horizontally at shoulder height. Use your feet to position your shoulders so that your dominant hand and arm are pointing your tennis racket at your intended target while your non-dominant hand and shoulder are pointing directly away from your intended target. Now, use your non-dominant hand to pull your tennis racket directly away from the intended target until the back of your dominant shoulder is slightly facing the target. Adjust the "eyes" on the front face of the tennis racket to look down at the bottom of the side fence. With your feet on the same line as your arms and shoulders, slowly take an average sized step in the direction of the target and swing the tennis racket (one hand or two) in super slow motion. Stop the swing when the tip of the tennis racket and your dominant hand are about the same distance from the intended target. At this point, most of your weight should have shifted onto your forward foot and your shoulder should be slightly closer to the target than your forward foot. The line through your shoulders prior to beginning the stroke was to show you how much shoulder turn you'd need to be able to hit a tennis ball in the horizontal direction of the target. The slow motion swing and stop was to show you where your intended string-to-ball contact point needs to be to send the ball to the target. Repeat this process from different court locations to get the feel for using your feet to set your shoulders up for various targets on the other side of the tennis court, using the forehand and the backhand. It is a tennis player's good timing that allows everything to work well on the tennis court. Good timing allows a tennis player to accurately stroke or hit a tennis ball to a desired primary target (height of net clearance) and then on to a desired secondary target (angle and distance). To accomplish this, he or she must be able to combine a proper amount of shoulder turn (a variable for angle control) with a proper contact point (a variable contributing to angular accuracy) and also be able to choose a proper bevel (a tennis variable for height control) to be combined with a proper speed (a tennis variable for distance control).